However I am loving this look! I got a bit brave and tried the triangle look that I love, but could never do! The only way I pulled it off was by being able to add the shapes on the side of the triangle! ;) they definitely helped! ;D Haha!! For this look I used my go to white at the moment, which is Urban Outfitters Optic White. Then the black is all acrylic paint! The lovely holo-y gold is Alchemist by Takko Lacquer. 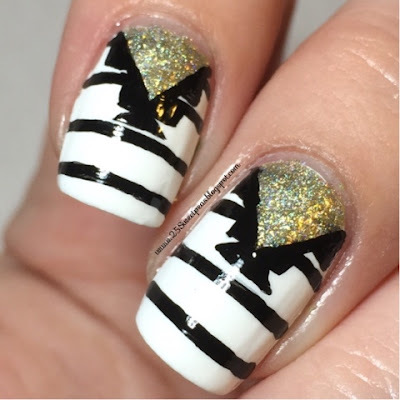 I just love this gold with the white and black. It's a great combo. It weird that I like gold polish because in my jewelry world I never wear gold! It's just not me, I'm a silver girl, but when it comes to polish I do love a good gold! This is for sure a favorite gold! I'm actually expecting a new gold in the mail later this month! I am getting Clockwork from the new ILNP line! So excited!! I love their polishes! I think if I had to pick my 3 guilty pleasure nail polish companies that I like to splurge on I would pick Takko Lacquer, ILNP, and Zoya! They are all just fabulous! One last picture! Ahh, I really do like these!! All of the imperfections aside, they are just fun! What do you all think?! Well I hope you all enjoyed this post! Now off to work on some more blog related things! Currently working on some art for my little nail studio in my room! Hopefully my ideas I have in my head will turn out! Enjoy your Saturday!